I was reading the title of this post again and again. I couldn’t believe I was going to write about life lessons but I guess I could now as I have some life experience. I definitely want to write about what I have learned in my not very long life and share it here hoping it might be helpful to someone. Having a husband like AS, who can be your therapist and psychiatrist is a great plus point in life. He has always helped me a lot ,especially when I am in pain or in my weakness. There are lots of things he has taught me and one of the thing he has always encouraged me is to tell people what I feel and what is in my head. I used to be a people person, trying hard to be friends, hard to be responsible in every relation I have like a daughter, sister, friend, cousin, SIL, DIL etc. However, most of the time, no one really saw my sacrifice to please them; actually in most case it went unnoticed. I didn’t even get a simple thank you instead I was taken for granted by the vary people who I was trying to please so hard. The way I used to deal with it in the past was to just get sad and upset but never in front of the people who said or did something to get me upset. It used to make me feel down to the point I used to cry and make me doubt my every move. I even fought with AS when he tried his best to get me out of my emotion whirlpool. It took hours and in some cases days to recover from those messes. On the other hand, the person who hurt me had no clue that I was upset let along care that they caused me pain. So recently I adapted the rule “Say what you are thinking”. Funny enough it worked so well for me because now I just let them know in kinder words that their action/word had hurt me. In most cases, they seemed to be surprise and say sorry. In others, they didn’t have a better come back so they just ignored it, but still getting my feeling out there was a big relief. For me it was the best as I spent less time thinking about it as it is already resolved from my side and now I can use the same energy in something better and I am a happier person. I know it may not work every time but I am sticking to it as it has definitely lessen my pain and anguish. Let me know if you agree with my views? P.S. We are in Central coast for our easter break. Hope everyone is having a great Easter too. HAPPY EASTER !!! This entry was posted in My Life Lesson and tagged life, say whay you feel. Bookmark the permalink. I have been saying what i feel to my in laws but to my regret they have termed me as an out casted person. And my husband worries that at least i could have enough strength to ignore or accept what they say not speaking up my mind. I definitely understand where your hubby stands but at the same time how would you feel not to speak out when you don’t like things. Do you regret what you said? Do you think things would have been better if you haven’t spoken your mind? If you have bottled up all the things, won’t you be an unhappy person? Also, why they are not being considerate and why it is only you who need to be. I still believe speaking your mind is not wrong, just maintain the respect for another person but do not let anyone hurt you. Having my blog has really taught me to be more assertive and say what I am thinking. I am trying to practice it in real life too. Girls don’t always have to be polite, although we are taught that. At least you still have someone to support, not letting you down or hurt you more when you have already enough hurt from other people . Yes, I think it is the best to what you’re thinking and totally agree with @Chai a Cup of Life in terms of it can make the situation worse and confusing. And my experience is exactly same as hers. And what you said it’s also true sometimes when you keep quiet or be nice to them, other person think you are weak or stupid so they just walk over you. As my experience. 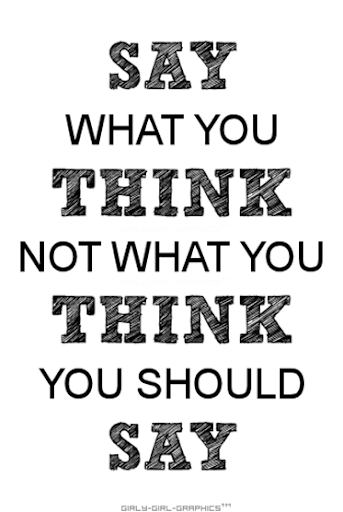 I think it is better to say what you’re thinking…most of the time. Better not to bottle things up inside, but sometimes it can make the situation worse or confusing. I say from experience that I tried to reach out to someone and and didn’t get a great response. But in saying that, I wouldn’t have known the response if I didn’t say anything in the first place!! I know there are times when you need to shut up but lately i realized that more you keep quite, more the other person use you or think you are weak so they try to walk over you. It’s a wise way to go. Yup. I had this issue long ago and people used to affect me so much.. now not so much anymore 🙂 good on your girl! Wow this is like reading inside my head. I am the same way, I never tell people what I feel. I seem to just internalize everything. But lately I’ve realized how bad it is for me to do that. I’m slowly starting to say what I think! I can understand the situation so well. But go ahead and speak your mind gal because no one cares if you don’t say it. Good luck.